See Ireland’s Ancient East and its elegant castles at your own pace. Visit Ireland's beautiful destinations in the comfort of a luxury coach. Tour the length and breadth of Britain in the comfort of a guided luxury coach. Do you want to go to one of the below destinations or further afield? We can take you wherever you want to go! 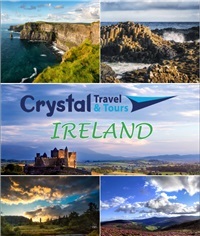 Our FREE Ireland Travel Guide is choc full of great ideas and information for anyone who might like to visit Ireland but doesn't really know where to start. Where to go, what to see, what type of tour to take, weather, frequently asked question, it's all there to assist you in making better decisions in how and when you travel. Sign up for our newsletter, take a look inside and contact us about your ideal vacation when you are ready.